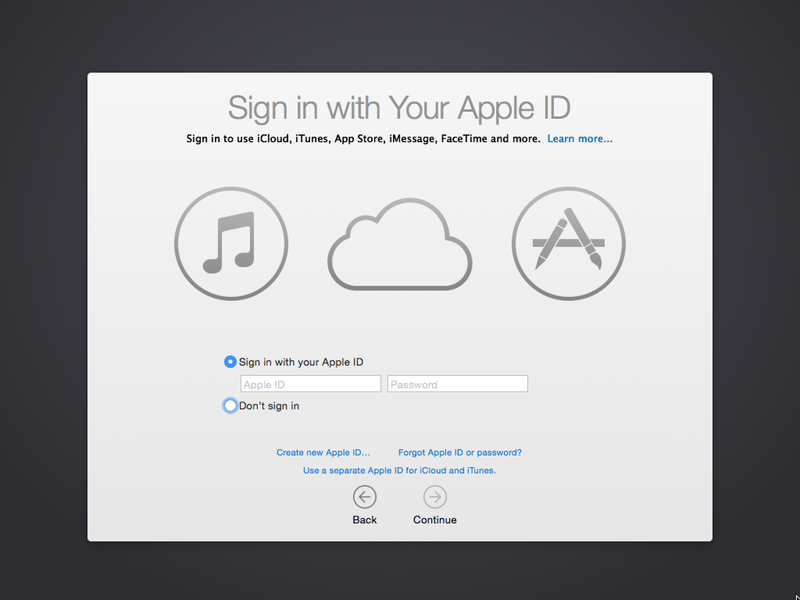 Starting in 10.7.2, Apple has set the iCloud sign-in to pop up on the first login. 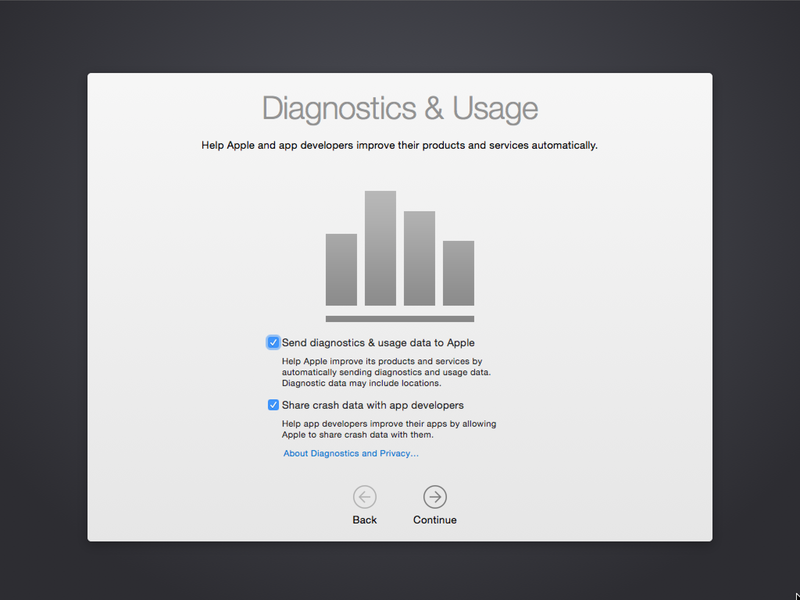 In 10.10, Apple added a new Diagnostics & Usage window that pops up at first login after the iCloud sign-in. Since having these pop-up windows appear may not be desirable in all Mac environments, it makes sense to be able to turn this off for new user accounts. As part of preparing for Yosemite in my own shop, I’ve developed a script that should disable both the iCloud and Diagnostics pop-ups on 10.7.2 – 10.10.0. See below the jump for the details. Apple is using /Users/username/Library/Preferences/com.apple.SetupAssistant.plist to store the settings that indicate whether or not the iCloud sign-in and Diagnostics agreement processes have run. Building on work done by the folks behind DeployStudio, I’ve built a script that pre-sets those values for new and existing accounts on a particular Mac. In turn, that should stop the iCloud and Diagnostics pop-up messages from appearing on that Mac. The script is below and is also available on my GitHub repo. This script is also available as a payload-free package on my GitHub repo, available for download from the payload_free_package directory available from the link above. Hi Rich. For upgrades, do you know if it’s possible to run this script through Casper Suite before the user logins in the first time? for Munki to detect successful installation on future passes, I found creating a flag file somewhere using touch in the post-install script and adding that file to the installs (and removing the flag file as part of the uninstall script) was necessary. Thanks to Mr. Trouton for sharing his knowledge. Rich you are the best! I deployed a stripped-down version of this in my JSS to suppress iCloud login after Yosemite upgrade – works like a champ. After deploying this script with our new image I find that Messages is trying to launch after login. I know this because we have Messages as a Restricted Application in Casper. After login there is a repeated pop up telling me an Application is restricted. Digging in to the jamf logs it shows that Messages is trying to launch. If I run the image without the script, Messages no longer is trying to launch. I wonder if there is 1 more file that needs to be “touched”. What do you do with the script ? I made a plist file and placed it in the launch agents folder. The script itself is in the scripts file. I made sure the files are executable. But it doesn’t work ! So, where do I put the scripts ?? I’m able to disable them for regular users in El Cap, but these commands don’t work for root (which I only use for initial configuration, then self-disable) if you dump them into /var/root/Library… instead of /System/Library…. It’s weird. Why would they work for all but root? Did anyone mange to make this work on Sierra?